Friday Fragments is the best place to kick back and unwind from your busy week, a place to also unload the randomness that clutters your mind so that you can enter the weekend unfettered. To learn more about Friday Fragments, click the FF tab above. *I decided I'd better change my header, thinking we'd seen the last of snow for a long while, but then we got some snow yesterday--crazy! The photo was taken by my friend Molly in 2005, when we went hiking together in Washington State, and it makes me very, very happy. Kyle, Kendall, and I are flying out there in June so that I can finally introduce them to one of my all-time favorite vacation destinations. I can't wait! *I'm typing this on a new laptop, and the learning curve is huge. I'm not complaining, though, of course. *Quote from a student who was trying (unsuccessfully) to wear me down, whining, arguing, threatening to walk out, rather than just sitting down and getting to work in study hall: "I wouldn't have to act like this if you would just let me do what I wanna do!" Really, kid? Too funny; I told him that one was going on my blog, since it was so hilarious! *Kailyn is doing better! She's been upgraded from C7 A to C8 B, which is great news. 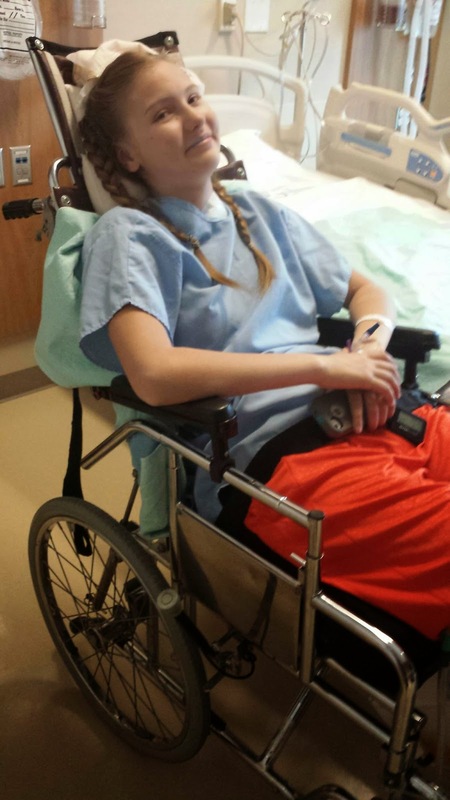 Kailyn finally made it into a wheelchair after two weeks of lying in bed! Visit her YouCaring page to learn more about Kailyn's story. Also, I'm going to be hosting a giveaway with a very nice prize for those who help get the word out and/or donate. I'll let you know when that goes up. *I've heard the song All of Me (John Legend) many, many times, of course. However, until this week, I'd never really paid attention to the words, and when I did, I found myself choking back tears! I feel that kind of love from Mr.4444 and don't take it for granted; it's a blessing to still be in love after 31 years together. We're going out for a romantic birthday (mine) dinner Saturday night--One more thing to look forward to. How about you? Looking forward to anything in particular?